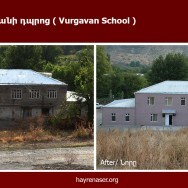 In the summer of 2015, the Hayrenaser Organization completely reconstructed the school of Vurgavan village in the Kashatagh region of Artsakh; and built a new community administration center along with a health clinic. This project transmitted a new hope to the villagers for a better future in their own town, who up until then were thinking about leaving it. Today, their children are able to study in a modern and comfortable school where their health is not endangered. The town affairs are discussed in the administration building, instead of the streets. Today, the people of Vurgavan believe in the future of their town. 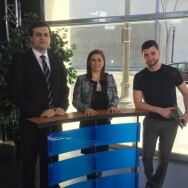 Hayrenaser Organization founders Stepan Sargsyan and Nelli Martirosyan were hosts on Armenia’s TV channel “Ararat”, where they spoke about Hayrenaser’s activities and their personal goals. 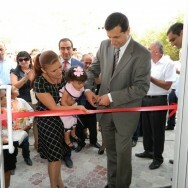 On September 5 the opening ceremony of the complex of the essential infrastructures took place in Vurgavan village of liberated Qashatagh region, Artsakh. 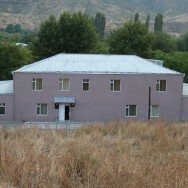 The complex houses completely reconstructed school, newly-built health clinic and village administration. The complex is built by Hayrenaser Organization during the summer of this year and Vurgavantsi schoolchildren met the new academic year at the new school. On September 5 the opening ceremony of the complex of essential infrastructures took place in Vurgavan village of liberated Qashatagh region. 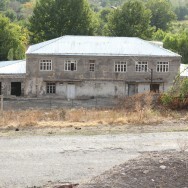 The complex houses completely reconstructed school building and newly-built village administration and ambulance. The project was fulfilled by Hayrenaser Organization. Arman is a construction worker from city of Berdzor, who has been living in the liberated Kashatagh Province of Artsakh since 1998. 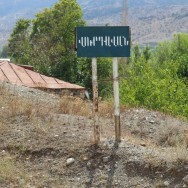 Arman’s family, father, mother, six brothers and sisters moved to Berdzor from Ara Village, in the Kotayk Province of Armenia. His father, also a construction worker, sold his ten hectare (24 acre) land and moved to the liberated homeland for a better life. Arman joined them two years later, after he came back from his military service. 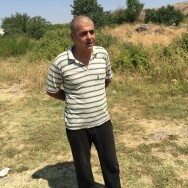 Gueorgui Khachatryan has been living in Vurgavan since the beginning of its resettlement in 1995-6, immediately after the ceasefire between Armenia and Azerbaijan. He was originally from Jermuk and participated in the liberation movement of Kashatagh Province of Artsakh. 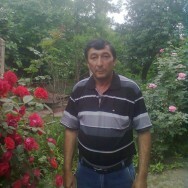 For two years, he lived in Aghavno Village, also known as Zaboukh , with his family, then moved to Vurgavan. Here is a video (in Armenian) about constructions of complex of essential infrastructures which are going on in Vurgavan village, Qashatagh region of Artsakh. The complex will house completely rebuilt school with new gym, newly-built health clinic and village administration. Watch the video to see the details of the constructions. We are happy to announce that the construction in Vurgavan village of Artsakh liberated Kashatagh region is in full swing. Hayrenaser organization completely reconstructs the village school and constructs new health clinic and village administration in Vurgavan. The locals are thrilled, their morale is high: this construction gives hope for tomorrow, gives future to Vurgavatsis. Co-founders of Hayrenaser Organization Stepan Sargsyan and Nelli Shushi Martirosyan at USArmenia TV Channel speak about the project which was carried out by the organization last year in Lernahovit community, Qashatagh region, Artsakh, where the school was completely rebuilt. They speak about their current project to build health clinic and new village administration and completely reconstruct the school in Vurgavan, another village of Qashatagh. 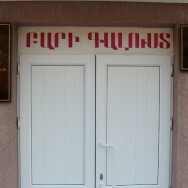 The guests of “PanArmenian Morning” TV program also refer to their personal goals.